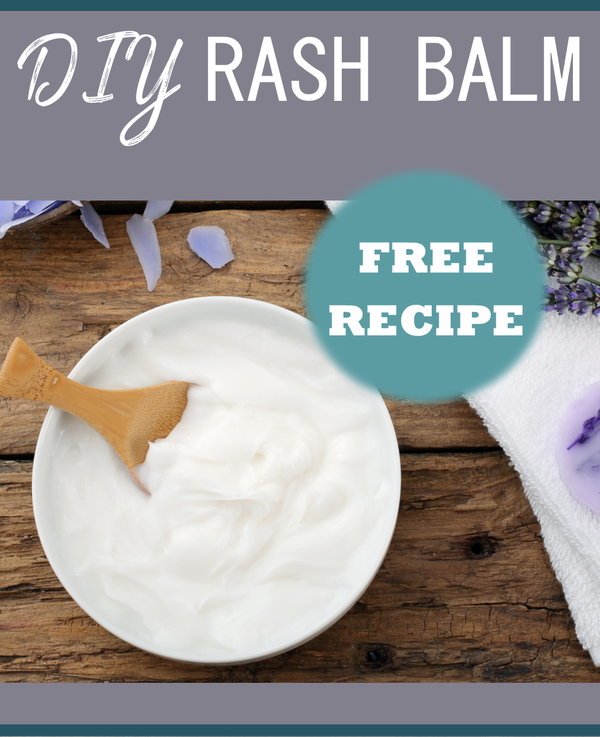 Download our free printable rash balm recipe here. For those of us who live in colder parts of the country, sun protection may not be the first thing on your mind this holiday season. All you skiers out there may have experienced the painful and aesthetically displeasing horror of extreme goggle burn. You may be the family traveling from Colorado to Disney World who forgot that t-shirts and sunshine are the norm in Orlando, even in January. If you are traveling to a sunny place this winter that involves a lot of sun and water play, be warned of the dreaded rash. Rashes pop up in many places! It’s just inevitable when you are: (1) wearing a swimming suit most of the day; (2) jumping in and out of the water; and (3) exposing yourself to copious quantities of sun. Especially on those kiddos and their sensitive skin! My own littles tend to get rashes on their shoulders where their life jackets rub, on the inner thigh where those pesky built in underwear on your swimming suit rub, and heat rash. It’s no fun for the child or the parent! It stings and stings, and every time you put on a swimming suit, life jacket or sunscreen, it stings some more. It’s enough to make a mama crazy! And not the good crazy. In the past I have tried everything from Vaseline to store bought rash creams, to no avail. Nothing works! And most commercial rash creams just sting when applied. That’s when I decided to make my own rash balm. Can you tell that I love DIY skincare? I mean, the after sun spray I made is nothing short of a miracle, so why not a rash balm too? Calendula: This flower has large amounts of antioxidants and increases blood circulation to the wound to aid healing. It’s also very soothing to the skin. Comfrey: Comfrey leaf can reduce inflammation and is great for bruises and sore muscles. It can help speed up healing as well. Just make sure to use it only topically. Chamomile: Also an anti-inflammatory and is soothing for the skin. Lavender: Lavender is an analgesic and will help relieve pain in the damaged area. It also has antibiotic properties and can help with cell regeneration. It’s soothing and calming to the skin. Essential Oils: Melaleuca oil is antimicrobial and anti-inflammatory. Chamomile and lavender oils help with pain and help sooth. Myrrh has antibacterial and healing properties.